The layout of the Volkswagen Milano Taxi concept resemele the NY taxi concept created by Giorgetto Giugiaro for New York City in 1976. 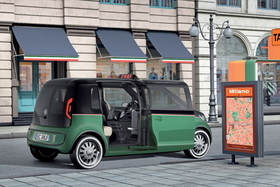 Like Giugiaro's taxi concept, the Milano features a single sliding door for the rear passengers and no front-passenger seat to provide more luggage space. It makes sense that the two taxis are alike. VW group design director Walter de' Silva admires the work done by Giugiaro, who is a charter member of the European Automotive Hall of Fame because of his work on models such as the first-generation VW Golf and the current Fiat Grande Punto. Another source of inspiration for de' Silva's concept was Milan, Italy, the city where the Italian native lived when he was styling director at Alfa Romeo from 1986 to 1998. De' Silva wanted the new concept to resemble 1960s Milan taxis, which were black on the top, green on the bottom and had a thin red-and-white stripe between. While de' Silva's concept includes features from the 1960s and 1970s its powertrain is pure 21st century. The Milano Taxi's 113-hp electric motor and a lithium-ion battery give it a top speed of 120kph (about 75 mph) and a range of 300km (about 186 miles). While Giugiaro's concept was never built there is a good chance de' Silva's will be as several large cities around the world prepare to seek bids for zero emission taxis.